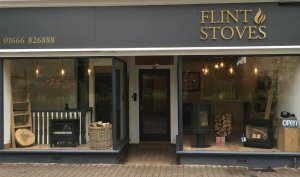 Flint Stoves is a local, independent, family business offering a full woodburning stove installation service in Malmesbury and the surrounding area. We are HETAS certified and approved dealers of a wide range of woodburning stoves, we pride ourselves on being able to advise you on the best design and fitting of your new woodburner. Call us today on 01666 826888 or 07826 867287 for your free home visit and site survey, or visit us at our showroom at 36 Gloucester Street, Malmesbury SN16 0AA. • Browse our range of quality woodburning stoves and fireside accessories. • Pick up stove brochures and price lists. • Book a free home visit & survey. • Get advice on the operation and maintenance of your stove. • Buy locally sourced well-seasoned logs.